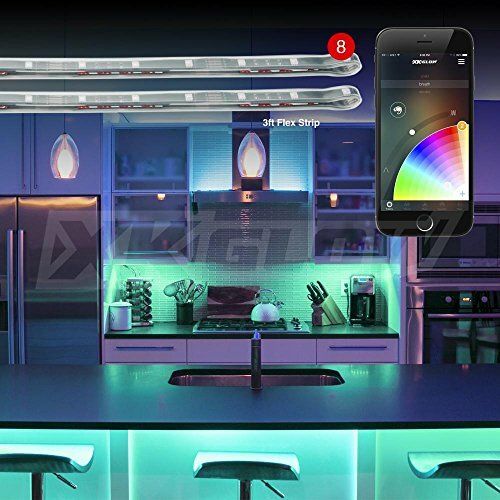 2nd Gen 8pc 3ft Flex Strips XKchrome App Control Home Indoor & Outdoor LED Accent Light Kit for Furniture Kitchen Bedroom Living Room Holiday Christmas Garden Garage Bathroom Deck Office Gym Basement by XKGLOW at IGWT. MPN: XK-HOME-S-ADV. Hurry! Limited time offer. Offer valid only while supplies last. What's Included: 1pc XKchrome BLE 4.0 app controller. Click here for detailed app instructions 8pc 3ft flex LED strips for interior lighting. What's Included: 1pc XKchrome BLE 4.0 app controller. Click here for detailed app instructions 8pc 3ft flex LED strips for interior lighting. Complete extension wire kit. Mounting accessories. 72 watt power adapter. Smartphone BLE 4.0 app controlled. Most advanced smartphone controller on the market. Check out the Themes feature. Coordinate your homes lighting with the colors of the holiday. The Chameleon feature allows you to capture the colors in realtime using your camera. Transferring the colors to your XKchrome lights. With our Music feature you can have your lights be controlled with the beat of the music, or sound picked up by the microphone. If you have any questions about this product by XKGLOW, contact us by completing and submitting the form below. If you are looking for a specif part number, please include it with your message.